Eliza took the photo above. It’s been so much fun watching her get creative with photography. At the pumpkin patch, she leaned right up to my lens and said, “Hold still.” I had no idea what she was doing until I looked through her photos. Eliza is new to instagram. She still doesn’t have a phone. She uses mine to check her account, post an occasional photo, text friends. It’s been a good way to ease into social media. I like seeing the world through her eyes. She said she doesn’t want a phone yet. And I am glad. She doesn’t want the responsibility, doesn’t want to be distracted by it, and has been watching how kids interact. She knows what it feels like to be ignored in a group when everyone else is on a phone. Not having a phone might put her out of the loop a bit, but she is happy and observant, and okay being without. We’ve had lots of discussions about the value of person to person contact vs. screen contact. How in person contact leads to positive emotional health; while too much screen time or screen communication can lead to negative emotional health. More on that idea in this fascinating podcast on iGen trends by Jean Twenge. I’ve been reading and listening to the research, eyes and ears open for articles, books, or talks on the subject of technology and teens. There is a lot to talk about. Data indicates that kids do better when they learn to connect in healthier ways. But it’s a hefty amount of info so I’ll save it for another post. For now, let’s talk about Autumn. Don’t you just smile when you remember Anne Shirley saying she couldn’t live in a world without Octobers? For me it is Septembers, Octobers, and Novembers. Everything about the natural world during these months calms me. The harvest, the withered vines, the snipping down of stems and blooms, the raking of leaves in all their unveiled hues. There is a fullness in all this letting go, of seeing one’s hard work be fruitful, meaningful. A slowness that is needful. Our garden now lies fallow, spontaneous blades of grass growing up in our empty patch of dirt. Summer’s leafy green is gone. The marigolds have been pulled, and all is quiet out back. I loved growing a garden this year. I will never forget the kindness of our neighbor, Jay (who is also our home teacher) when he brought his tiller over and stayed out way past dark with me – both our tillers grinding into the dirt, trying to make it soft for planting. He knew I was determined to grow something this year. That by reaching into the dirt, I would find my Mom, work out my grief, give me a place to feel her. So we tilled, then dug holes, and dropped in seeds. We dug irrigation lines and each of the kids took turns helping me water. We grew cherry tomatoes, yellow squash, a variety of pumpkins, and potted herbs on the porch where the deer couldn’t reach them. I wish we could experiment with beans and peas, but the deer eat almost everything. It was a happy summer for me, spending an hour or more every day tending our garden. Each morning I would kick off my running shoes, don my red boots, then head out to clear the vegetable garden of weeds. I let the early morning sun spill over my shoulders and warm my back, bending and digging, getting dirty, and thinking about my Mom. Then I moved to the front of the house to water and weed, where I would visit with neighbors passing by, and laugh when they made comments about my boots and running shorts. Out front, we planted two dozen annuals and perennials, purchased with a gift card from my dear Israel friends after my Mom passed. It was such a thoughtful thing to give. In a couple years, the color will fill in. I thought of these friends every time I dug about their blooms. We ate squash for dinner, made pesto with our cherry tomatoes and basil, and finally mid-October, we harvested our pumpkins. They filled the front porch. A few remained on the back porch, but Spencer didn’t want them to feel left out so he gave them names. Bob, Joe and Billy. As green sank into gold, Betsy brought over a most tender gift. 50 daffodil bulbs to plant in memory of my Mom. Come Spring, amid all the light and newness of earth resurrected, our daffodils will rise out of the darkness and we will think of our Grandma Ronda. Thank you Betsy! All the kids helped (verbiage has varied interpretation) with the planting. While digging in one of his bulbs, Spencer said, “Mom! I think we should cut some of these daffodils in the spring and take them to Grandma’s Grave!” A perfect idea. And so we will. Ali loves our new mailboxes and taking the key to see what has arrived. Look at that shimmering gold behind her! Halloween is a couple weeks behind us but the candy (and candy wrappers) continue to surface. The other day I found all of this, every bit of it, in the gap between Gordon’s bed and the wall. You know that gap? That black hole of child refuse? So many wrappers, books, toys, socks and underwear, and… a busted PVC pipe used as a dagger?! My goodness. Boys. She ate hers first. Like a boss. Both of us thought our little snails were quite tasty! Getting them out of their shells, however, was a task! Tons of laughs! I was so happy to head to the hills with Michelle. And SO grateful for her help in moving my blog out of the prehistoric era! I hope you can be patient with me as I continue to edit old posts, and update the nav bar. I know links aren’t working, photos are old, and text is outdated. Bear with me! I’m always learning from Michelle. She and her kids came up with this fun idea of tying a bag of fortune cookies to a trail sign. Each cookie has a happy message. Written on the bag in permanent marker, it says, “Take one!” She is always spreading happiness. Millcreek remains our favorite canyon in the Fall. One Sunday afternoon we decided to drive up Guardsman Pass to see the colors. But this bit of red was all we could find. We had missed the colors in the high country entirely! So we pulled off just below the pass and had fun playing in all the fallen leaves. It’s always more fun when Doug is with us. Since the kids were little they have loved playing Leaf Monster. I’m pretty sure Doug made this game up. Cover the monster in leaves, count down from 10, then the monster will explode out of the leaves and chase you, tagging the next leaf monster. We went to Petersen’s Pumpkin Patch this year. Something different. And it was awesome. 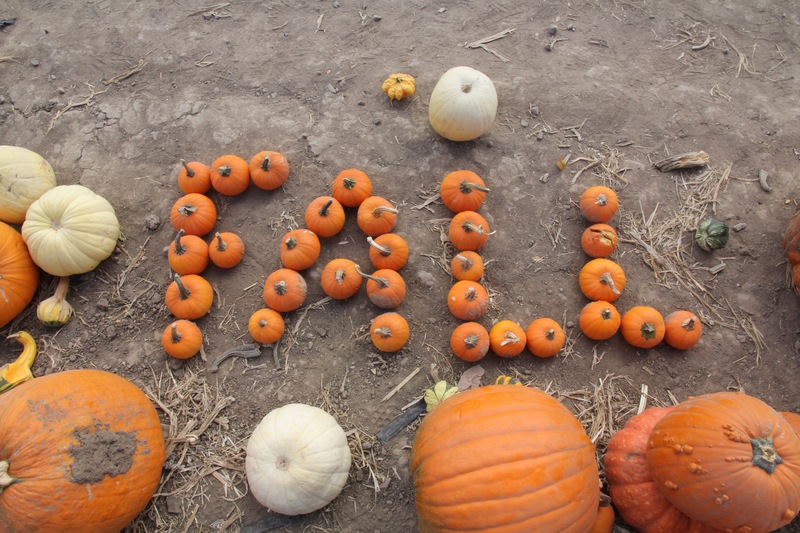 Great prices, so many pumpkins, apples, animals to feed, and a small corn maze. Now rewind for just a bit. Way back at the beginning of October I did something I never thought I’d do again. I ran the St. George marathon. I had this unspoken wish of wanting to run another marathon after having all my kids, but it just seemed so daunting. And training takes so much time. Thank heavens for this amazing team of ladies. I never would have done it without them. It was so much fun training together. They inspired me in so many ways. Pushing through injuries, encouraging each other, setting PRs and even qualifying for Boston! The course was gorgeous, the temperature absolutely perfect. And everyone laughs at marathon photos, right? Some people look amazing. Most look hilarious. I have this weird “grit my teeth” face in every picture. But at least I have proof that it happened. This moment here though, was the best. The moment right before the finish line, when I saw my family. I bee-lined it to them, high-fived them all as I went by, then ran across the finish line. One of my other quiet goals was to qualify for Boston. Last time I qualified, we moved to DC, 9-11 happened, I started a new job, and Boston just didn’t materialize. So I decided to give this race all I had. All of us were dealing with some kind of previous injury. All of us were nervous and worried about how it would go. So we said a prayer before heading to the buses (3:45 AM) and prayed that angels would be with us as we ran. I felt that strength. I thought of my Mom again and again while running, of all the hard physical things she did, and how much she wanted to run, or even walk, during her last months. I ran for her. And that made all the difference. I ran my second fastest marathon time and qualified. Some of these ladies were angels to others on the road. Rebecca saw an older gentleman struggling along. She had suffered a severe ankle sprain a month earlier and had come back from a boot and crutches. She was running slower than her usual but used that empathy to lift someone else. She said to the man, “Come on! You can do this. Let’s run together!” And they crossed the finish line side by side. All of these women showed incredible determination and strength. Each is definitely an angel to me. Running friends hear everything. The worst, the best, the funny, the hard. And they have carried me through so much grief. I will be forever grateful for each of them! Doug was a tremendous support. He was registered to run the marathon as well but we couldn’t figure out child care, and training for both of us was getting hard. So he took a raincheck on this one and became my cheerleader. While I am SO glad the marathon is over, maybe I can talk some of these gals into doing Boston. And EP, I will be looking for you at mile 19! And lastly, a birthday trip to Southern Utah. Zion’s was über crazy! Way too many people. I do NOT recommend it over Fall break. But we stuck out the shuttle lines and traffic, and once we got into Hidden Canyon, the wait was worth it! Liza on the stone steps. And just when I thought mother nature couldn’t do any better, Sami found this wonder! We’ve been enjoying all the fall feels. All the glory of it. And while I haven’t posted the utter disaster that reigns inside our house most of the time, the fighting, the boys throwing rocks at the worker’s trucks next door, or the day Spencer tripped while running along the top of a brick wall, face-planted, and fell five feet down onto the sidewalk (Sami was sure he was spewing teeth; turned out it was an apple he’d been chewing. 😳😂), sometimes it’s good for me to focus on the beauty here. On the gifts. The joys and gratitudes that layer this crazy family life. I hope November fills your soul. Please do a post on kids and phones! I would love to see what other people think, and I can tell you think more about it like I do!